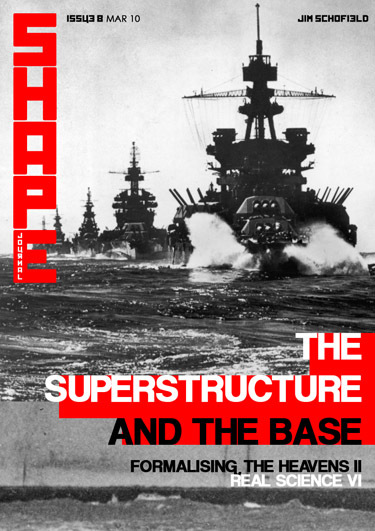 Welcome to Issue 8 of SHAPE Journal. In the next few issues of the journal there will finally appear a series of papers addressing the foundations of our very different and alternative basis for both Philosophy and Science. It will, of course, be quite evident by now to regular readers that all papers thus far published here have had their own different assumed basis, and it has become essential that such a basis must be now made clear and overt, as it is far from being the usual consensus in either of these important disciplines. Downwards Through an Emergence, Order Out of Chaos, Paths to Chaos or Paths to Glory, and finally, Coherence from Incomplete Sequences. Such a limited set can, of course, constitute only a beginning to outlining this important standpoint, and the author has continued writing regularly on these matters for many years. This present set cannot deliver the current state of the author's position, and he will later on be presenting important new contributions on Emergence, Evolution and Holisitc Science, with reformulations of Miller's famous experiment on the Origin of Life on Earth, with others addressing the inner trajectory of Emergences, and an alternative to the usual consensus picture of Modern Cosmology. The best is yet to come, for to present such stuff from the outset would be meaningless, without careful establishment of evidence and individual conclusions. Such ideas are not the building bricks of understanding, but surely the crucial foundations and mortar of a coherent and comprehensive erection, and every forthcoming contribution will deliver on these basic requirements, as well as on wholly new theories and particular and necessary updates to others. Read and enjoy, and if moved to do so, react!